Whether in it 'terminal' phase colors as seen here, or in its initial phase, the Cortez Rainbow Wrasse or Paddlefin Wrasse is one of the most beautiful of the Thalassoma wrasses! This wrasse is named not only for its native environment, the Sea of Cortez, but also for its bold rainbow coloring. Like all the Thalassoma wrasses, the Cortez Rainbow Wrasse has more than one color phase and for this fish there are two. In their natural environment the these fish are most abundant as juveniles and initial phase females with a striped rainbow pattern. A few terminal phase males, like the one pictured above, will be mixed in. In either phase they are beautiful and a joy to watch. The Cortez Rainbow Wrasse is active, hardy, and long-lived in the aquarium. Though smaller than most of these wrasses it is still very active during the day and will need to have plenty of swimming room. It also will need a lot of rockwork with nooks and crannies for retreating as well as for sleeping at night. Juveniles will sometimes act as cleaners but become aggressive as adults. It is an excellent fish for the community aquarium as long as its tank mates are of a similar temperament. This wrasse doesn't bother corals but it will eat crustaceans, invertebrates, and small fish. It may even eat mantis shrimp and bristleworms. The handsome male Cortez Rainbow Wrasses have 3 bright colors, while the pretty juveniles and females have a red tail and are black and yellow striped! They only grow to around 6" and are a great addition to your reef tank. They will pick off Bristle Worms and small hermit crabs and very small snails, but will not bother corals. The Cortez Rainbow Wrasse is as colorful a juvenile as an adult! The horizontal stripes of yellow, black, red and white of the juvenile give way to a beautiful color block scheme. Their colorful head can be purple, red and/or green, followed by a yellow collar, then a red to reddish pink body, and ending with a blue to purple tail fin! All this color packed into a 6" fish, the Cortez Rainbow Wrasse is coveted by wrasse loving aquarists! 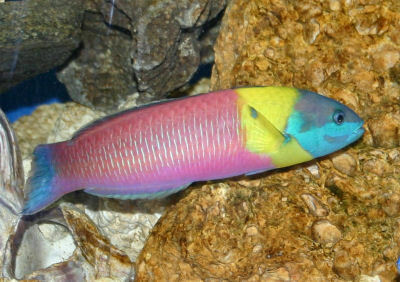 The Cortez Rainbow Wrasse was described by Gill in 1863. They are found in the Sea of Cortez or Gulf of California, south to Panama and the Galapagos Islands. Inhabiting shallow rocky lagoons and reefs at depths down to 210 feet (64 meters), they are seen swimming in large loose groups of 50 or more fish, or in small groups consisting of females with one dominant male. The Cortez Rainbow Wrasse has two color phases. Juveniles and initial phase fish have yellow, black, and red horizontal stripes. As this fish ages, the black mid-body stripe becomes broader and jagged and the yellows fade. Secondary or terminal phase males (females that have changed into males) are characterized by a bright yellow band just behind a blue to green head, a purplish blue tail and a red body. Adults can reach up to about 6 inches (15 cm). This wrasse is hardy and moderately easy to maintain. Generally not considered totally reef safe as it will eat most of your small crustaceans and invertebrates, though it will not bother your corals or plants. House with other aggressive species at least the same size, and to reduce incidents add this wrasse last to the aquarium. The Cortez Rainbow Wrasse becomes more aggressive as it ages. The Cortez Rainbow Wrasses are carnivorous, in the wild they eat small hard-shelled invertebrates, crustaceans, worms, and fish. Feed a varied protein diet including small crustacea such as feeder shrimp, chopped up marine flesh, formulas and frozen foods such as mysis and brineshrimp, and even flake foods. They are high energy fish that need to be fed 2 or 3 times a day. A minimum 50 gallon (189 liters) aquarium. 75 gallons or larger if kept as a pair. No special requirements, though does enjoy patches of sunlight. No special requirements. Normal temperatures for marine fish is between 74° and 79° F (23 - 26° C), but can be kept up to 83° F (28°C). Should be kept singly or may be kept with a mate if the aquarium is 75 gallons or larger. Though juveniles sometimes act as cleaners these fish become aggressive as adults. House with similar sized aggressive fish; tangs and triggers make good tank mates. Avoid slow moving or smaller fish as they will be harassed, possibly eaten. Females will have the initial phase striped color patterning while males will have the secondary or terminal phase coloring. See the details of these two phases above under 'Description'. Not yet bred in captivity. The Cortez Rainbow Wrasses have two methods of spawning. The first method is where large loose groups of 50 or more fish will rise from the bottom, release eggs and sperm at the top of the water column, then quickly dart back down. This method has been observed as being most common in the summer. The second method is where a terminal male will form a harem and spawn with individual females. The Cortez Rainbow Wrasse is often available, both on the internet or through pet stores and is moderately priced.